Well, what do you know. I actually made it to my classics challenge this year! 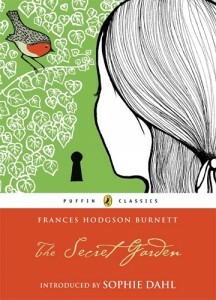 I know that I wouldn’t be able to read another Austen before 2011 ends, nor even try to read another long classic (Little Women, I’m looking at you) with all the other books I want to read, so I settled for an author that I have known and trusted since I was a kid: Frances Hodgson Burnett. Young Cedric Errol lives in poverty in New York with his mother. On the death of his English father — disinherited for marrying an American — Cedric is summoned to the family castle by his grandfather. There the crotchety Earl plans to transform the boy into a docile, traditional lordling. But Little Lord Fauntleroy does the converting. Through his goodness and innocence, he wins the hearts of his English relatives, who welcome his mother warmly. 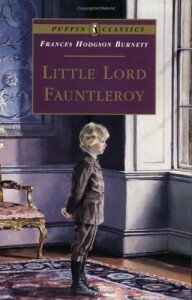 Would you believe that I have never heard of Little Lord Fauntleroy until this year? When I was a kid, I only knew of little Cedric “Ceddie” Errol through this morning cartoon that I watch during summer vacation, same as where I first found out who Sara Crewe was. Ceddie is a little boy who lives with his mom and dad in New York. His dad passed away, and shortly after, they found out that Ceddie was actually the next in line as the Earl of Dorincourt in England, and so he and his mom goes to England. Despite this good fortune, Ceddie’s grandfather, the current Earl, is angry at the Ceddie’s mother because he thought of her as a commoner and he forbade her to see Ceddie, hoping the little boy will forget his mom. The Earl had a bad reputation because of his attitude, but Ceddie wins him over and eventually makes him accept his mother as a part of the family. The cartoon I remember was pretty accurate to the book, except maybe that the Earl was more obstinate and harder to like in the cartoon. I also thought the cartoon Ceddie looked a little bit too feminine, and there was that entire flute playing thing that was definitely not in the book. However, as I was reading the book, I realized that the Ceddie in the book was more adorable than the one in the cartoon. 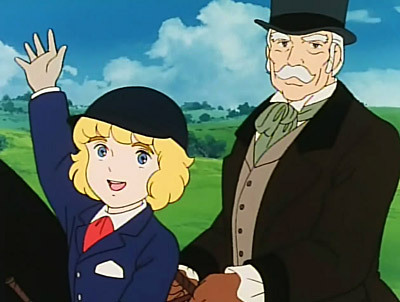 Perhaps it’s because it’s been so long since I last watched it, but I thought the Little Lord Fauntleroy in the book was more charming than the one I remember. The little boy is the kind that I think everyone dreams of meeting — you know, that perfect little kid who has a heart of gold, one who can melt even the hardest of hearts. Reading Little Lord Fauntleroy was a treat because of the main character. In a way, it reminded me a lot of A Little Princess because of the the similarities between the two of them, even if I still think Sara had it harder than Ceddie. Even if it seems almost entirely impossible to know someone who could be as nice and as good-hearted as Ceddie was, somehow, this book made me wish that there are still good hearts like that out there, someone whose kindness knows no bound and is determined to see the good in everything and everyone. What secrets lie behind the doors at Misselthwaite Manor? Recently arrived at her uncle’s estate, orphaned Mary Lennox is spoiled, sickly, and certain she won’t enjoy living there. Then she discovers the arched doorway into an overgrown garden, shut up since the death of her aunt ten years earlier. Mary soon begins transforming it into a thing of beauty–unaware that she is changing too. But Misselthwaite hides another secret, as Mary discovers one night. High in a dark room, away from the rest of the house, lies her young cousin, Colin, who believes he is an incurable invalid, destined to die young. His tantrums are so frightful, no one can reason with him. If only, Mary hopes, she can get Colin to love the secret garden as much as she does, its magic will work wonders on him. Here’s another book that I also watched as a cartoon when I was younger, although I think I read this one first before I watched it. However, for the life of me, I cannot remember the details of this book anymore. I just know there was Mary, and there was Dickon the outdoor boy, and Colin, the invalid cousin. I cannot remember the tiny details even if I know I have watched the movie several times (the image of Mary’s hand extending out of the ivy curtain from the door of the secret garden beckoning someone to come in is still clear in my mind). If in A Little Princess and in Little Lord Fauntleroy, the author’s main characters were easy to love characters, The Secret Garden takes a different turn by introducing Mary Lennox also known as “Mistress Mary quite contrary”. Mary is a spoiled and neglected kid from India who grew up with her mom’s servants answering every beck and call. A cholera outbreak left the little girl orphaned, and she was adopted by an equally distant uncle to live in Misselthwaite Manor, instructed to keep out of locked rooms and not be a bother. But when Mary discovers a secret garden locked for the past decade within the manor grounds and decided to take care of it, she finds herself changing from the spoiled kid to someone more likeable. As Mary was going through the changes, she discovers her sickly cousin Colin who believes that he will die soon of some kind of disease. Mary shares her secret with Colin — but will the garden’s magic have an effect on someone who’s so convinced that he will no longer see tomorrow? The Secret Garden was refreshing from all the Frances Hodgson Burnett books I’ve read because Mary Lennox wasn’t an easy character to like. She was spoiled, stubborn and was used to having her own way. I remember the cartoon showing Mary was a pretty nice girl but the people in the Manor — particularly Mrs. Medlock — were too strict, but reading the book told me otherwise. There really wasn’t anything likeable about her, up until she changes because of the garden and even then, she still had those little quirks that could be annoying. But the interesting thing here was when Mary found herself meeting a boy who was even more spoiled than she was, and one who suffers a very bleak mindset. It was interesting to see how Mary challenges the way Colin thinks by just being her spoiled, stubborn self. The scene where Mary dealt with Colin’s tantrums was one of my favorites, because Mary stayed true to her character up until the end — I find myself thinking like one of the servants in the Manor thinking “How brave of her to do something like that!” Colin was really a piece of work, and I found myself taking even a longer time to warm up to him even if I knew he gets to be a better person in the end. On the other side of the spectrum is Dickon, the boy from the moor and the animal charmer. I remember his playful character in the cartoon, but I think the book version was less mischievous but equally charming, especially with all the animals he brings around. Dickon provides a good balance between Mary and Colin, and I had to admit I was very excited for his first appearance in the book as I was reading it! While the two other Frances Hodgson Burnett novels I’ve read dealt with how a kind heart can weather any storm or soften any heart, The Secret Garden was kind of the reverse. This book showed how beauty and nature can revive a tired and hopeless spirit, how the “Magic” in everyday things can change even the sourest and saddest people into living. It’s easy to see why this book became so timeless: at some point, we’ve all hoped to find an old key that leads to a secret garden where we can find solace, to watch beauty unfurl and to be a part of magic of nature. Much more surprising things can happen to anyone who, when a disagreeable or discouraged thought comes into his mind, just has the sense to remember in time and push it out by putting in an agreeable determinedly courageous one. Two things cannot be in one place. 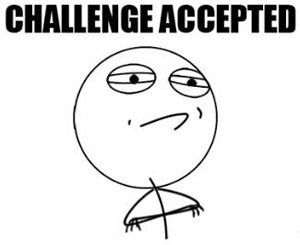 I didn’t do a Required Reading post/challenge last November on purpose because I was too busy with NaNoWriMo to really stress over what I wanted to read for November. I guess I wasn’t able to explain that — so apologies to those who were looking for one! Anyway, so let’s so a little recap for October first before anything else, yes? Breathe by Cliff McNish – I finished this early, actually, although I wasn’t able to review it until late. Anyway, I liked it, and I admit to being a bit scared with this for a while. It was an interesting experience with a McNish book. I’m not sure if I will read more, but I’m open to it. There’s a certain thrill with scaring myself in a month, but I don’t think I’m up to doing it every month. :D Still, it was kind of fun. I should also probably finish Come Be My Light by Brian Kolodiejchuk and Mother Teresa, because it’s been on my currently reading list since this March. I remember one of the conversations I had with some friends about how some do not review the books they read. Some of them admit that they’re not that good with writing, while other people said that they didn’t want to feel obligated to think about having to write something, and instead just read the book for fun. Now, being a writer and a talkative person, I never felt the burden of writing reviews for the books I read. Yes, sometimes I don’t review a book, but lately I’ve been enjoying writing notes about the books I read so much that it’s never been a burden for me to write. Taking a cue from Honey’s latest post, though, I like the tag line of this year’s Teen Read Week: read for the fun of it. While I have always been reading for fun, but sometimes I tend to forget and I put too much pressure on myself when I write a review or finish a book. Looking at my TBR mountain, I know I feel pressured to finish most of it, so I tend to read and read and read and worry about how I can make the mountain smaller (and also finish off my challenges). Which brings me to my Ten Teen Reads! 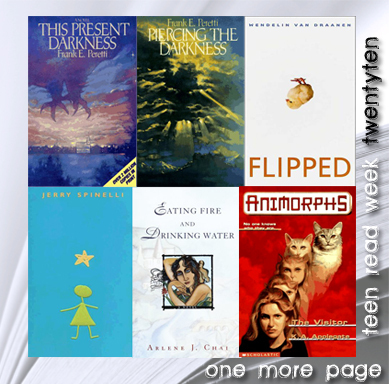 I don’t know how it connects exactly to what I wrote up there, but I thought I’d also list the books I loved to read as a teen. Note that they’re not exclusively YA because I hardly picked up YA fiction, then. I’m not really sure what kinds of books I used to read then actually. Hrm. Anyway. This Present Darkness and Piercing the Darkness by Frank Peretti. I discovered Frank Peretti through my friend Pau during freshman year in high school. She told me about it, but I only got to read it by junior year. When I finished reading it, I didn’t want to give it back because I loved it so much. I loved the storytelling and the story itself, especially the angels and how they get their strength from the praying people. :) The sequel I read when I finally got my own copy of the book and there is this scene that always always makes me cry. These two books pretty much started my love for Peretti. Eating Fire and Drinking Water by Arlene Chai. I think I read Chai when some blogger friends (back when blogging was really just journaling online) started recommending her. It’s really one of the first few serious novels I read that’s set in the Philippines. I loved Eating Fire and Drinking Water for reasons I really couldn’t point out. I think I would have to revisit this book again to find out. Animorphs series by K.A. Applegate. I must not forget the only sci-fi series that I grew up with. I learned of this series from my best friend, and at first I thought it was more of a fantasy series. where the kids have extraordinary powers with no real need for it. To my surprise it wasn’t — it was darker and grittier and it had deer-human-scorpion aliens! I remember scouring the bookstores every month for the new books. It’s just sad I kind of lost interest in it so I haven’t collected all the books. Now I’m on the lookout for the books I don’t have. 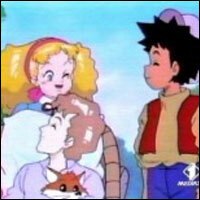 Do you remember this cartoon character from those morning cartoons in ABS-CBN? 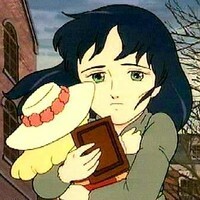 In case you’re from an younger generation, the cartoon character is Sarah Crewe, from the 1985 Japanese anime produced by Nippon Animation, based on Frances Hodgson Burnett’s novel, A Little Princess (Wikipedia). This was shown in ABS-CBN in the 90’s, during 10:00am, and various movies have been made based on this series as well. This is undoubtedly one of my favorite cartoons, and it led me to search the novel and read it. 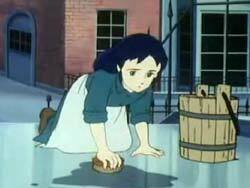 I remember wishing so bad to be Princess Sarah, and having her beautiful room and her dolls and clothes, and even going through the same struggles, content in knowing that there is a brighter tomorrow in store for her. I can’t remember the last time I read A Little Princess by Frances Hodgson Burnett, but I knew it’s been a long time since I did so. It’s one of the classics that I knew for sure I read multiple times and loved every single time I did. It wasn’t until lately that I felt the need to read it again, perhaps to cleanse my palate from all the intense reads I’ve had lately. For those unfamiliar, A Little Princess is the story of Sara Crewe (no h in the book), the daughter of rich, doting father, Captain Crewe, who is sent to Miss Minchin’s Seminary for Girls to study. Miss Minchin secretly thinks that Sara is spoiled, despite her becoming the favorite pupil and classmate because of her intelligence and imagination. Sara befriends most of the students but becomes especially close to slow and pudgy Ermengarde, crybaby Lottie and scullery maid Becky. Other students call her Princess Sara after news of her father’s investment on diamond mines spread, and while this embarrasses her at first, Sara learns to use this to remind herself to be compassionate to others. Sara’s lavish eleventh birthday party was abruptly put to a stop after the news of her father’s death, leaving her orphaned and penniless, after his father’s friend disappears with all their mone. Miss Minchin is forced to adopt her and she falls from being the show pupil to a drudge, helping Becky out in the kitchen and in various errands around the school. Sara makes use of her imagination, strength and compassion to get through the next three years as a servant, attempting to pretend her cold and hunger away, finding comfort from the few friends she had left, and doing her best to still act like a princess despite being a pauper.